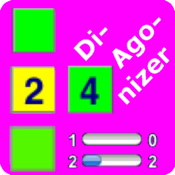 Welcome to DiAgonizer™! This logical puzzle game could be the ultimate Sudoku-killer ... put up to 60 numbers in a grid, all in the right cell, which can be easy to very hard! No trial and error needed, all puzzles can be solved by applying mere logic. This addictive game will entertain you not for hours, days or weeks, but for months, even years! This PRO version contains puzzles of six different sizes, with 300 puzzles of each size ... Have fun!